Glee has been losing me lately. I keep watching because I love the music and the actors, but the storylines they’re given. Ugh! But this week’s episode was so sweet, and the music so spectacular. In a way, the music from West Side Story is so fail-proof you could croak it out and still recognize its beauty. (Written by the wonderful, but rhythmically sadistic Leonard Bernstein.) But of course they did better than croak it out. The whole reason I’m bringing this up though is to talk about the kid who sang the lead in the Warbler’s rendition of Uptown Girl. He is so charismatic it was like a talent explosion. It reminded me of when we were first introduced to Darren Criss, he had that same breath-takingly dazzling effect. His name is Curt Mega. Make him a main character, please! I loved what they did with Uptown Girl, I watched it three times, but there was something missing from the soundtrack. I can’t put my finger on it. It’s not an issue with the singing, it just felt thin, or hollow or something, I don’t know. But my ear was expecting something that just wasn’t there. This is looking in the window of the relatively recently opened Jimmy Choo store on Bleecker. 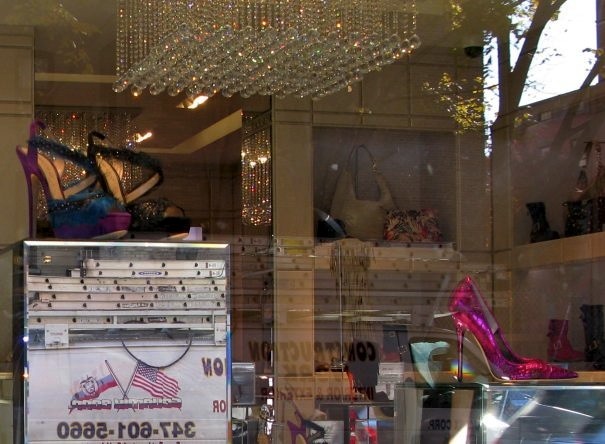 I couldn’t wear any of these (or afford them) but every shoe in that window is a work of art. I would like to go back and take shots from inside, because the pictures I got don’t capture the gorgeosity of these shoes. Those ones on the upper left for instance, you are not getting the subtlety and range of the colors, or really seeing the embellishments.